Will the new Microgaming StarDust Slot sweep away the opposition? 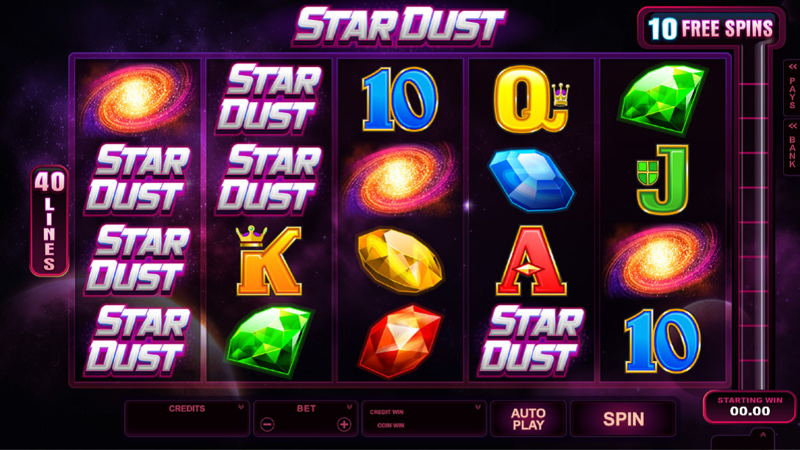 How would you describe the new StarDust Slot from Microgaming? Space-age? Iconic? Retro? Groundbreaking? 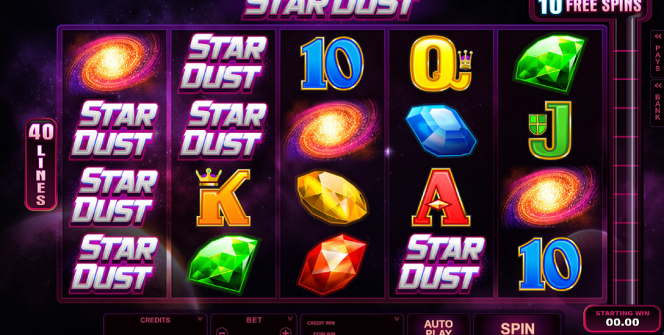 In truth, this fantastic new slot contains all these elements and more, which makes us believe that this is a sure-fire smash hit in waiting when it hits casinos this December. The Space-age reference is obvious given that the central theme is space and in particular galaxies although other icons on the reels include the high symbol gems and the lower ranked playing card symbols. This certainly adds to the feel that the slot is somewhat retro. Groundbreaking? Well, how about a 5×4 slot that offers 40-paylines in the base game which can be spun for as little as 0.40 per spin. Ok, while that may not sound groundbreaking as such, there are other 5×4 slots out there to play, what is groundbreaking is the way in which you access the fantastic test spins round from within the base game. To do this, you need to land the Galaxy symbol on the middle reel. From here, the Galaxy will charge up the StarDust Meter by collecting all the gems that have come to rest on the other reels on the screen. Each gem collected awards one test spin and a cash prize to the pot. Once you have collected 10 or more gems in this way, the test Spins game is triggered. This is where the groundbreaking side of things continues with a staggering 1024 paylines in operation during test spins as well as a Radiant Respin feature, which means that every 3 or 4 symbol payline will see the non winning reels spun again with the chance of creating an even bigger winning payline. That’s not all however as during test spins all Wild symbols are Super Stacked 12-high giving you an even better chance of a winning payline. Add to that a 100,000 coin jackpot to be won and you have all the ingredients for one of the brightest slots in the gaming universe, which will certainly be regarded as iconic for many years to come.